These are perfect for indulging in at Christmas, or for giving as a handmade gift in a presentation box. The flavours are even better if you can marinate the prunes in Armagnac for several weeks before you make them. Put the prunes and Armagnac in a bowl to soak for as long as possible, cover and top up the Armagnac if necessary. Chop the chocolate into small pieces and put into a large bowl. Heat the cream and sugar slowly in a pan until it just comes to the boil, take off the heat, wait for it to stop bubbling and pour onto the chopped chocolate. Stir gently together until it blends into a thick glossy chocolate emulsion or ganache. Purée the prunes in a hand blender and stir into the ganache, plus 1-2 teaspoons of the soaking juice, or more Armagnac, to taste. Put the ganache somewhere cool for at least 1 hour or until firm enough to roll into balls. 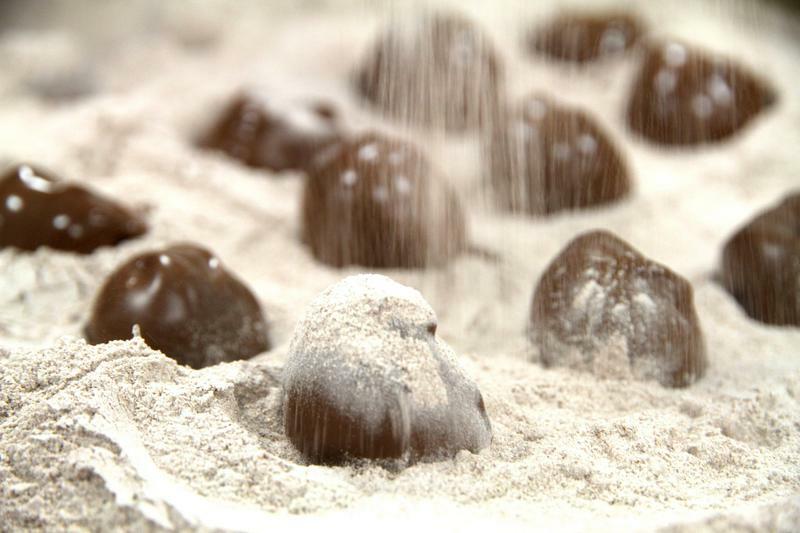 To make truffle balls simply put some cocoa powder on your hands, use a teaspoon to scoop a small amount from the ganache, and then roll it around in your hands to make a ball shape. Put each ball onto a baking tray lined with parchment. If they have got very soft in this process, put in the fridge for a few minutes to firm up slightly but do not let them get too cold. If you just want to cover your truffles without dipping them in chocolate first, line a flat baking tray with sieved icing sugar or cocoa powder. Place each truffle ball on top of the finish and with a spoon, ensure that the truffle is covered before gently rolling them. Be careful when doing this as they will be soft and you don’t want to dent them. Put the truffles in an airtight container in the fridge and eat as soon as possible! Melt 140g of the extra 200g of dark chocolate in a bowl sitting over a pan with a little water. Ensure that the water does not touch the bottom of the bowl and melt it very slowly. When the chocolate has melted, take it off the heat, add the remaining 60g of chopped chocolate and stir in. This will help to bring the temperature of the melted chocolate down and help ensure that it is at a better temperature for dipping your truffles. While the chocolate is melting, cover a baking tray with your preferred finish. Drop each truffle ball into the melted chocolate with your hands one at a time and then fish each out with a fork. Gently tap your fork on the edge of the bowl to help remove excess chocolate from your truffle. Place the dipped truffle gently in the finishing tray and check that it is totally sealed with chocolate before covering it – use the fork to cover any holes. Sprinkle your finish over the top of the truffles with a spoon. Don’t be tempted to roll them around in the finish too soon as the chocolate will take a few minutes to set hard enough to touch without leaving thumbprints in them. Put your finished truffles on a baking tray lined with baking parchment in a cool place to set. You can keep your truffles in a cool place in an airtight box for up to 10 days, but as with any fresh handmade product, they are best eaten as soon as possible! Top tip - what to do if your ganache “splits”: when blending a ganache, the chocolate and cream can sometimes separate rather than forming a luscious thick chocolate emulsion. This can happen for various reasons and my advice is not to worry, it is usually fixable. For small quantities of ganache, as in these recipes, bring another c50ml of cream to the boil. Add that gradually to your ganache, stirring all the time, you may not need all of it. This should help “bond” the fats in the chocolate and cream again and return your ganache to a shiny chocolate cream, rather than a horrible looking mess! Let your imagination run wild but you could replace the prunes with medjool dates steeped in brandy, lexia or Chilean flame raisins in dark rum, or naturally sundried apricots in apricot brandy.